While the 3D TVs shown at CES in 2009 were very much in the prototype stages, this year should see the arrival of 3D TVs we can actually buy. Panasonic is keen to be at the forefront of the 3D revival and it's stand at this year's CES is dominated by the technology. So what better way to shout about your 3D prowess than by developing the world's largest Full HD 3D gimmick plasma display? Measuring 152 inches (just a tad bigger than its 150-inch plasma – pictured), Panasonic's ultra-large, 4K x 2K (4,096 x 2,160) screen is an absolute giant amongst HD TVs. You'll be lucky to find a wall big enough to mount it. Let alone a wallet fat enough to afford it. The monster 3D TV apparently has a screen area that's equivalent to nine 50-inch TV panels. It follows other notable Panasonic 'firsts' — the development of the industry's first 103-inch Full HD 3D PDP (introduced in 2008) and the 50-inch Full HD 3D PDP (unveiled in 2009). As a technology demonstrator for Panasonic's consumer 3D screens to come, this 152-inch Full HD 3D PDP TV uses Panasonic's newly-developed ultra high-speed 3D drive technology. This, says Panasonic, adopts "super-efficient quadruple luminance efficiency technology", enabling it to achieve a higher illuminating speed that's ideal for rapid 3D image display. If you still care about contrast ratios, Panasonic's 152-incher is rated at 5,000,000:1. 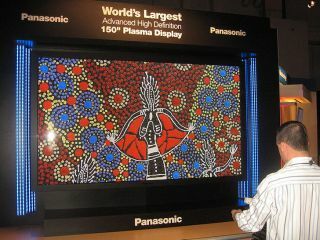 Panasonic has also developed some clever 'cross-talk' technology to improve the 3D viewing experience. "Because displaying 3D images involves alternate displays of left- and right-eye images," says Panasonic, "reducing the overlap (cross-talk) between these images is essential for high-quality 3D images." "Compared to other display technologies that use line-at-a-time driving method, PDPs use frame-at-a-time driving method that gives PDP TVs an advantage in crosstalk reduction in principle." Of course, with 3D content limited to pioneering satellite channels and a handful of Blu-ray 3D discs, all we've got is Panasonic's word for it.